If you’re on certain beaches in Huatulco—the ones surrounded by steep rocky cliffs that plunge into the ocean—maybe you’ve been approached by a vendor bearing a plate of a dozen oysters en sus conchas (“on the half-shell”). They’ll run you about $100 mxn, and if you’re sitting in a restaurant, no problema, because no one seems to care if you add them to your meal. BUT . . . lots of people won’t touch them, let alone taste them. Raw? Slimy? Illness inducing? Eeuuyew!!! Coming from the foodie town of Portland, Maine, I’m a little stunned. We’re happily equipped with any number of places to eat raw oysters. Eventide Oyster Co. usually has twenty or so varieties on ice, including Kumamotos, “worshipped for their amazing sweetness and clean, fruity aromas . . . beautifully fluted shells and plump meats with a hint of honeydew in both flavor and color.” Sampled at the Grand Central Oyster Bar in New York City, the more briny Baja Kumamoto is “famed for its diminutive size, sweet flavor, and cucumber finish.” You’ll pay a lot more than $6.26 (today’s exchange rate for $100 mxn) for a dozen Kumamotos in Portland or New York—actually, somewhere between $2.05 US and $3.15 US per oyster. Who knew oysters would give wine a run for its money in purple prose? And that different species of oysters would give rise to innumerable varieties differentiated by the waters they grow in? If you’d like a lesson in the lingo of oysters, go to the “oyster finder” (www.oysterguide.com/oyster-finder/ ), where you can read about well over 300 varieties, and learn that what’s billed as a Kumamoto is “the Chardonnay of oysters because it’s sweet, fruity, non intimidating, and everybody likes it.” The Oyster Bar also serves Bahia Falsa (medium briny and sweet) and Carlsbad del Sol (sweet/briny, overtones of melon) from Baja California, and they’re both basically Kumamotos. Even though the Pacific cupped oyster (Crassostrea gigas), which numbers the Kumamotos as one of its smaller varieties, only arrived on the west coast of Mexico from Japan in the early 1970s, it’s most probably what gets plated up with hot sauce and limes on the beaches of Huatulco. They are usually harvested by divers right from those rocks at the margins of Maguey, Arrocito, or even Santa Cruz. Now that’s fresh! Oyster Production in Mexico But divers with sturdy knives and fishnet bags on ropes tied around their waists is hardly where Mexican oyster production is at. Mexico is usually counted as the sixth-largest producer of oysters in the world, after China, South Korea, and Japan, then the United States and France. China harvests 38,236,222 metric tons (metric ton = 2,204.6 pounds) a year, Mexico 569,479. In addition to Crassostrea gigas, the native oysters Crassostrea corteziensis and Crassostrea iridescens are found—and farmed—on Mexico’s west coast, mostly along the coasts of the Baja peninsula and Sonora, with some produced in Guerrero and Sinaloa. The attraction for aquaculture enterprises is the California Current coming down from Alaska—it chills the waters to temperatures in the 50s and 60s °F (10 – 15 °C). Oyster production in the Pacific is much smaller than that in the Gulf of Mexico, but it produces more oysters for export. Its history also makes Pacific oyster production more “modern” than it is in the Gulf. The intentional diffusion from Japan of Crassostrea gigas began in the 1920s in the U.S., followed by its introduction to Europe and Australia. It was introduced in the Sea of Cortez in 1973, as part of a project of the Institute of Oceanology Research (Instituto de Investigaciones Oceanológicas) at the Autonomous University of Baja California (Universidad Autónoma de Baja California). The project included technical training in the U.S. in the production of oyster seed. Oyster culture has had its ups and downs since then, with various diseases taking a toll; recovery has been steady since 2010, and research at the University is now concentrating on the genetics of disease resistance. This economic development approach, as well as the capacity to produce oysters that appeal to those who like them raw, has made Baja attractive to international investment and collaboration. Sol Azul Seafarms, Inc., was started by a Mexican aquaculturist and a French oyster-grower in 1993; Sol Azul was producing commercial crops by the late 1990s, and is now the largest oyster producer in Mexico. 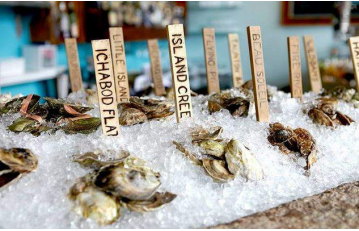 The Grand Central Oyster Bar buys its oysters from MaxMar, started by two British aquaculturists who teamed up with a Mexican oceanographer; MaxMar runs its own lab for propagating oyster seed. Oyster farming in the Gulf of Mexico produces approximately 85-90% of Mexico’s oysters in the lagoons that lie right behind the shoreline of the Gulf. The species is Crassostrea virginica, with Veracruz producing the most oysters, followed by Tabasco, Tamaulipas, and Campeche. Most of these oysters are eaten where they’re produced, they’re used primarily in cooked dishes, and the oyster farmers integrate their oyster harvesting with other fishing and seafood harvesting. And don’t forget the pearls! Oyster culture builds on centuries, perhaps millennia, of oyster harvesting in Mexico. In the Templo Mayor in Mexico City, beneath a carving of the Aztec earth goddess Tlaltecuhtli, is a stone tray with miscellaneous offerings—“bones and stones”—that include mollusk shells from the Pacific. Archeologists infer that the Aztec empire may have reached the Pacific right around 1500. And where there are oysters, there are pearls. Shortly after 1500, Spanish “explorers” reached the Sea of Cortez and found the Pericú people wearing jewelry that featured blackened pearls. It was believed that the pearls were blackened because the Pericú opened the pearls by roasting them, but in fact the species of oyster—Pinctada mazatlancia and Pteria stema—that produce black pearls are entirely distinct from the “eating oysters.” By 1889, the Compañia Perlifera de la Baja California dominated worldwide pearl production. The New York Times noted in 1903 that the value of pearls from Baja reached exceeded $2,000,000 in 1902. By 1936, the pearl oyster beds had been so over-exploited it was hard to find a pearl oyster, let alone one that had actually grown long enough to produce a pearl. The Mexican government effectively banned pearl fishing in 1940 in the hopes the oyster beds would recover; in 1993, the Monterrey Institute of Technology (Tecnológico de Monterrey) instituted a research program to establish a cultured pearl industry, with a Pearl Farm in Guaymas on the Sea of Cortez. Tours are available.